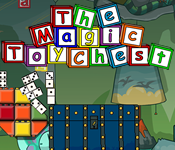 Casual Review took a look at the Magic Toy Chest. You can read the full review here. "Here’s a game that might actually change children’s attitudes when it comes to cleaning up their room. " "The game is definitely one worth experiencing if you have never tried anything from “The Incredible Machine” series before." "There is no single way to solve the puzzles — you have the freedom to use the toys you’re provided as you like and make use of the pre-placed toys in the level to achieve your objective." Hopefully, we'll address the major complaints (really bright graphics) with our title update.